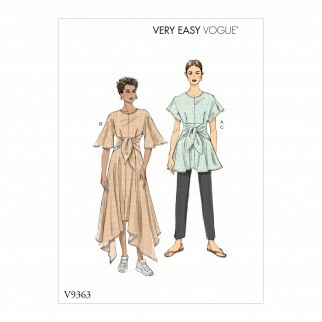 Tunic and dress are close fitting through bust with back zipper, shaped waist seam, self ties at waist, and length and sleeve variations with purchased bias tape at neck. B: Shaped hem, wrong side of fabric will show. Fabric suggestions include: Crepe, Linen Blends, Rayon Challis, Broadcloth.